/ What is clean eating? 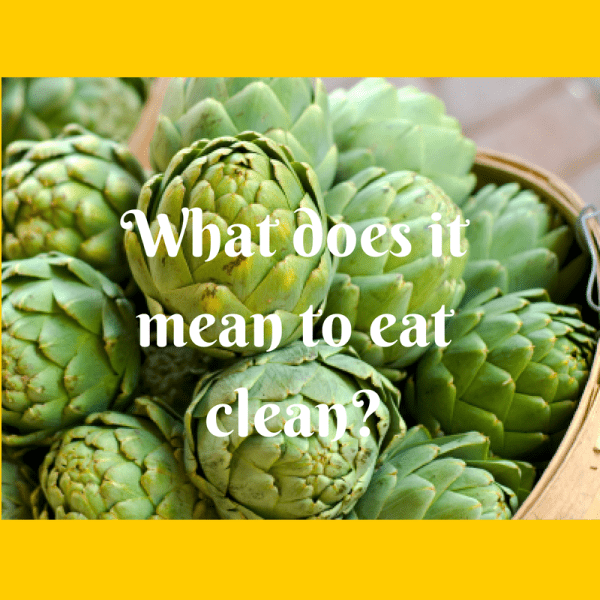 What is “clean eating”? This is by far the most frequent question I get. There appears to be much confusion about what the term clean eating truly means. Adding to the confusion are the many different theories about the best way to eat including paleo, vegan, gluten free, sugar free, and raw just to name a few. I’m all about simplifying things and clean eating is a great way to keep life very simple. To begin let’s examine what clean eating truly means. The basic definition of eating clean is eating foods that have been as minimally processed as possible. This means consuming real food from nature as opposed to pre packaged foods that were made in a factory. A clean eating diet consists primarily of fresh fruits and vegetables, grains, dairy and protein. Clean eating also means eating every few hours. To be honest, this is really what initially attracted me to the idea of eating clean. Eating 3 times a day is not really the best thing for your metabolism. Before I discovered the correct way to eat, I’d eat breakfast around 7:00 and be starving by noon when it was time for lunch. As a result I would eat way too many calories. I would then eat dinner at 6 and overeat yet again because it had been too long since I had eaten anything. Sound familiar? Eating every few hours keeps your metabolism running smoothly and keeps blood sugar levels on an even keel so you don’t overeat at mealtime. An average day on a clean eating plan looks like this: Breakfast – Snack – Lunch – Snack – Dinner. Eating this way means you’re eating every few hours and you never feel overly hungry. Clean eating simply meaning eating as close to nature as possible. If mother nature made it then it’s clean. If it was made in a factory then it is NOT clean. Can I be a vegetarian and still eat clean? Yes! It is very easy to maintain a vegetarian lifestyle and still be a clean eater. What about red meat? Do I have to give it up in order to eat clean? The good news is no, you don’t have to give up red meat. However, if you absolutely have to eat a hamburger or a steak, make sure it’s grass fed beef. Read here about the benefits of grass fed beef. The short answer is no. Alcohol turns to sugar in the body and many alcoholic beverages are made with gmo’s. See which beers to avoid here. Alcohol also contains lots of calories which can contribute to weight gain. It’s always best to avoid drinking your calories if at all possible. If you absolutely MUST have an alcoholic beverage, try to limit it to 1 or 2 a week. I actually encourage cheating. It helps you stay on track and gives you a reward for all that hard work you’re doing. Limit your cheats to one meal a week. What are some recommendations for snacks? Snacks are great and are encouraged when you’re eating clean. Snack suggestions include yogurt, dried fruit, veggies and hummus, nuts (watch your portion sizes), fruit, air popped popcorn, smoothies, nut butters, whole grain crackers, tortilla chips and salsa. What about special occasions such as parties where I don’t know what foods will be served? This one can be tricky. One method you can use is to eat before you go to the party. That way you won’t be tempted to eat a bunch of unhealthy food just because it’s there. Another option is to offer to bring a dish. This way you know at least one of the items there will be a healthy one. What about kids? How do I get them on board with eating clean? I have 2 children so I know how tough it can be to get healthy food into the little ones. It makes it even harder when their friends are eating foods that are less than healthy. Getting your kids involved in food preparation has really helped our family tremendously. Kids are much more likely to eat food they’ve had a hand in preparing. Taking kids to farmer’s markets, to the grocery store and getting them involved in growing their own vegetables goes a long way toward helping children become healthy eaters. Keep in mind that you as the parent control what foods are kept in your home. Offer them 2 healthy options so they feel like they have some control over what they’re eating. Keep cut up fruit and veggies in the fridge so they’re easily available for snacking. Hard boil a few eggs for a healthy high protein snack. Make your own granola and have them help you! Here’s a great granola recipe everyone will love. I love eating clean because it makes eating and meal planning simple. It’s made me and my entire family much healthier. And isn’t having a simple, happy and healthy life what we all really want?